Product code: ES7787 Categories: Sold Items, Sold Rings. 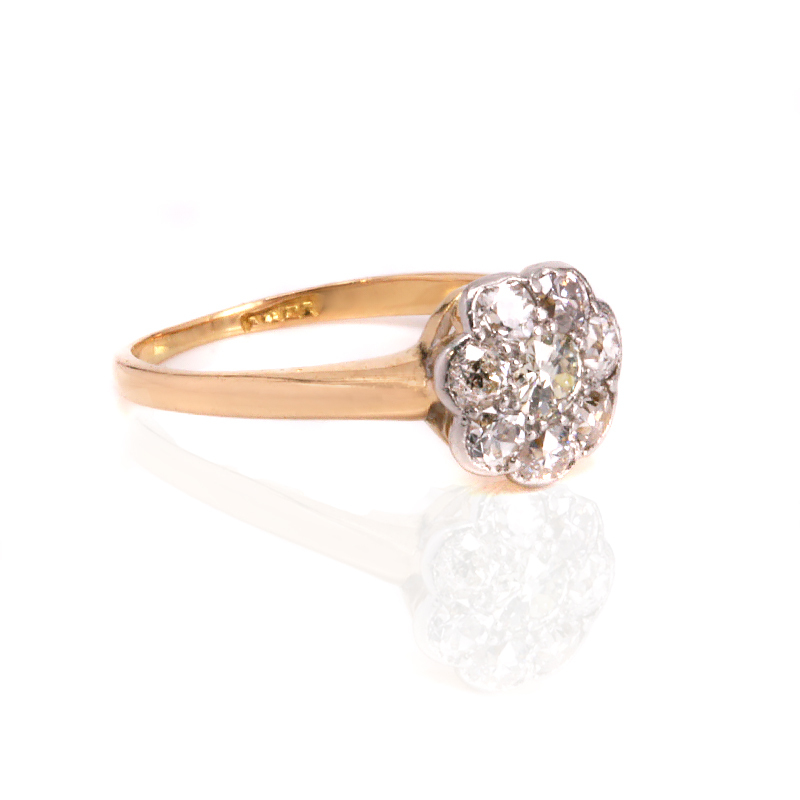 Perfect for any finger and occasion including making a very lovely engagement ring, comes this very elegant 18ct yellow gold diamond cluster ring from the 1930’s. Regardless of the finger that this ring is worn, there is no doubt that the diamond cluster has stood the test of time and looks as beautiful and stylish today as they were many years ago. Set with one diamond in the centre and a further eight surrounding it, the diamonds total 0.45 carats and have a magnificent sparkle to them all. With the top measuring 8.5mm by 9.4mm this ring will always stand out either on its own or when worn with a wedding band along side. So elegant and refined, this diamond cluster ring is just perfect. Tag: Art Deco diamond cluster engagement ring. 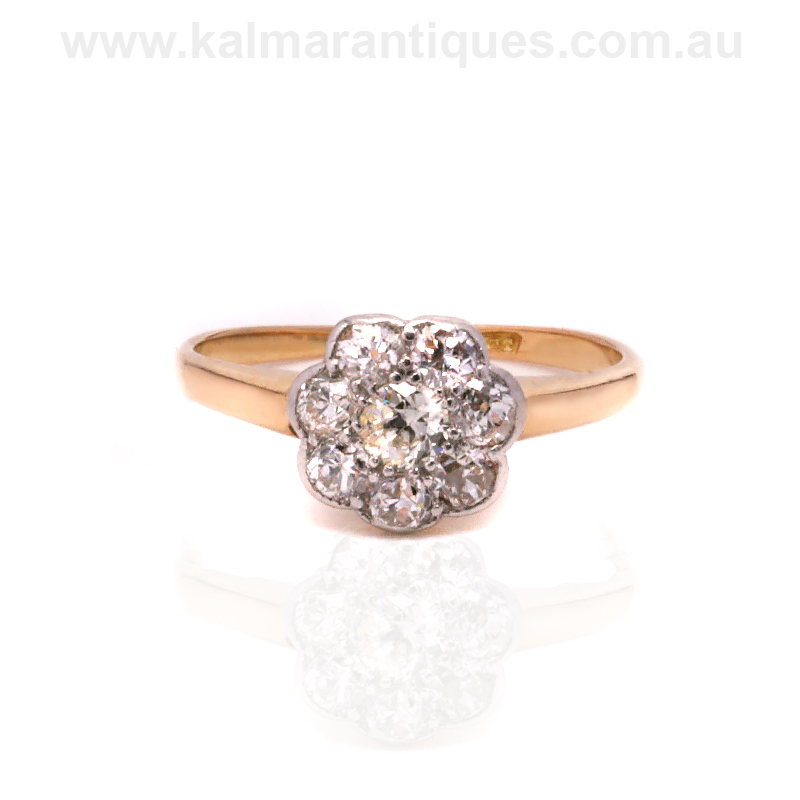 This diamond cluster engagement ring was all hand made during the Art Deco period. Art Deco engagement rings are more popular now than ever before. With the Art Deco period from the 1920’s until the 1940’s, the desire by women the world over for a genuine Art Deco engagement ring has never gone out of style or fashion.